Bazan A. (2007) Des fantômes dans la voix. Une hypothèse neuropsychanalytique sur la structure de l’inconscient.Editions Liber. In 1897 Freud reported a little case study in a letter to his friend Fließ: “Mr. E. had an anxiety attack at the age of ten when he tried to catch a black beetle (…). [D]welling on the theme of “being unable to make up one’s mind”, he repeated a conversation between his grandmother and his aunt about the marriage of his mother (…) from which it emerged that she had not been able to make up her mind for quite some time; then he suddenly came up with the black beetle, which he had not mentioned for months, and from that to ladybug [Marienkäfer] (his mother’s name was Marie); then he laughed out loud (…). Then we broke off and next time he told me that before the session the meaning of the beetle [Käfer] had occurred to him; namely: qué faire? = being unable to make up one’s mind … meschugge!”. 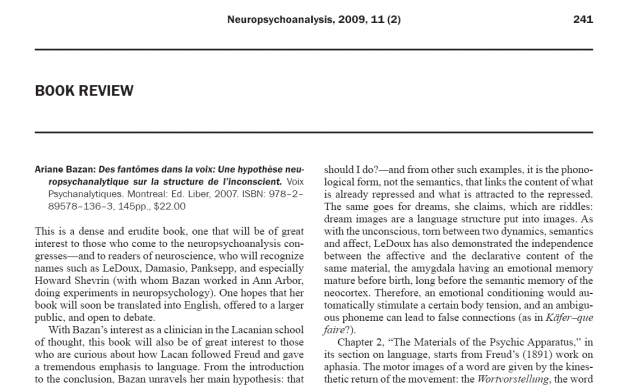 The point of departure of this book is the clinical observation, unique to psychoanalysis and reiterated consistently throughout Freud’s work, that the literal word choices of the patient, especially for those words which carry a particular emotional valence (e.g., expressing preferences, distastes, symptoms, dreams, etc.) are frequently indicative of an underlying etiological dynamic when considered on a phonological level. Throughout the book this observation will serve as a guide for the progressive construction of an integrative neuro-psychoanalytic theoretical model which could explain this phenomenon. First, Freud proposes the idea that defence against unbearable thoughts might operate by a “splitting of consciousness” in which the declarative content and the emotional valence are separated and handled largely independently. This proposal resonates well with the neuroscientific research of Ledoux, which shows that the scenic part of an experience and its emotional valence are processed in radically different neurophysiological pathways and can therefore be experienced separately. In Freud’s model, the emotional valence attaches itself to a new carrier, associated in (phonological) form though not in meaning with the original one, leading to the formation of so-called “false connections”. In this case study, the unbearable anxiety elicited by the mother’s ambivalence towards her husband has been displaced onto a radically different – although phonologically equivalent – object (namely a bug). The first part of the book therefore proposes the following line of thought: A linguistic emotional memory comes to maturation during development carrying the memory of connections between phonological fragments and important affects, either directly (especially for the early encodings before mature semantic access) or mediated by semantics. When phoneme fragments with important emotional valence are subsequently encountered during linguistic interaction, they will not necessarily be experienced in the context of their original emotional significance. For example, they might be encountered embedded between words or in a homonymic signification. Psycholinguistic research indeed shows that language is structurally ambiguous: Since words are not separated by pauses, each sentence can induce a multiplicity of hearings and all of these give rise to the transient activation of their corresponding semantics. However, before a hundred milliseconds have elapsed, all non-contextual semantics are inhibited, leaving only the contextual meaning for conscious experience. This dynamic is active and energy-demanding, such that, were the inhibited meaning needed for the understanding of a new language fragment following immediately upon the inhibition, one would experience a difficulty in finding it. This psycholinguistic finding very much resembles the dynamic Freud proposes to explain his own forgetting of the name ‘Signorelli’: Indeed, having been so efficient in repressing the fragment “Herr, was ist, etc.” which was not socially acceptable since it pertains to sexual and death-related material, Freud was also kept from accessing the name ‘Signorelli’ immediately upon this – ‘Herr’ and ‘Signorelli’ being associated by the vector ‘Signor’, such that the bridge between the repressed and the ‘forgotten’ is eventually phonologic and not semantic in nature. Psycholinguistically, therefore, this way of considering repression makes sense. Other research shows that the prefrontal inhibition of non-contextual meanings is not necessarily effective on a subcortical level where the emotional valence is treated: Affect is therefore released even if originating from a non-contextual reading, the semantics of which has been inhibited. Nevertheless, if this emotion is intense, it is most often given a (false) rational explanation in line with the context, resulting in a false connection. In the second part of the book, language is considered in its motor articulatory status: Whether received, produced, or imagined, brain motor systems (e.g., Broca) intervene in language processing. Motor neuroscience shows that when there is a structural gap between a motor intention and a motor realisation – e.g., when there is absence of peripheral motor structures due to missing limbs – a phantom representation arises based upon information derived exclusively from the motor commands. Some language fragments are thought to be subject to such a structural disconnection: The threat of unmanageable emotional release is thought to induce an unbridgeable gap between an urge to speak and the effective realisation of this urge. It is therefore proposed that the blockade of certain phonemic fragments also results in the emergence of phantoms, so-called “phonemic phantoms”, which exert a persistent pressure for the reappearance of their motor form, i.e., for the reappearance of their phonemes. However, these reappear with a different semantic meaning (the intended one being unbearable), i.e., as the “return of the repressed”. The substitute forms are, however, unable to definitively ease the original urge. As a result, the phonemic phantoms don’t disappear but maintain a determining influence on the (linguistic) attention and activity of the subject. In summary, a model for a linguistically structured unconscious is proposed which considers that during the course of a subject’s history a number of phonemic fragments have come under structural disconnection (i.e., under repression), resulting in the emergence of a tissue of phonemic phantoms organizing the subject’s action space. The book ends with a clinical case illustrating this proposal. e.g. the semantics of the word ‘sword’ is transiently activated in this very sentence by the phoneme fragment between ‘since’ and ‘words’.